While summer was in full swing, the heat had turned me into a lazy writer. Our corner office was bathed in strong, debilitating sunlight for most of the day, and it was impossible to stay focused on anything for long. I found myself just coasting until we headed off for new adventures, beginning with a month-long vacation before the university resumed classes. Although February is unofficially the official month for Chilean family vacations, we were off to an early start this past Christmas and New Year’s, when Sunshine walking in red high-tops, aka Donovan, came down to Chile to visit with his mom Christy and grandma Sandy. 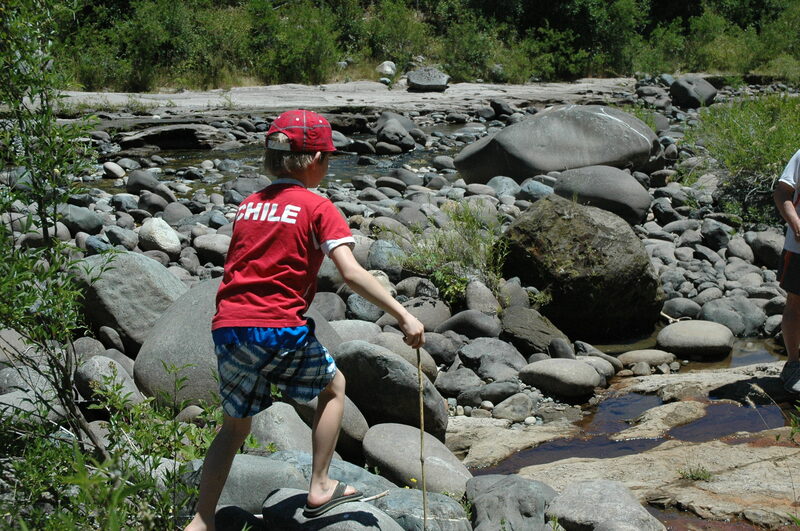 The youngest of my partner’s sons, Donovan was able to spend 11 action-packed days, hanging out with Papi, meeting Chilean family, sampling Chilean heritage, and frolicking in both Andes Mountain- and Pacific Ocean waters. Our travels took him from mountains to ocean, and from a major city to provincial city to resort city to tiny pueblo, and back to the Chilean capital before setting off for the frigid cold and snow of home. The day after Christmas, we packed the car to the roof with camp gear, friends Adolay and Carla, Donovan, sidekick Teddy (Missy was in heat and staying behind with Adolay’s family), my beloved Chileno and myself, and headed to our favorite camp destination, Camping Huequecura. 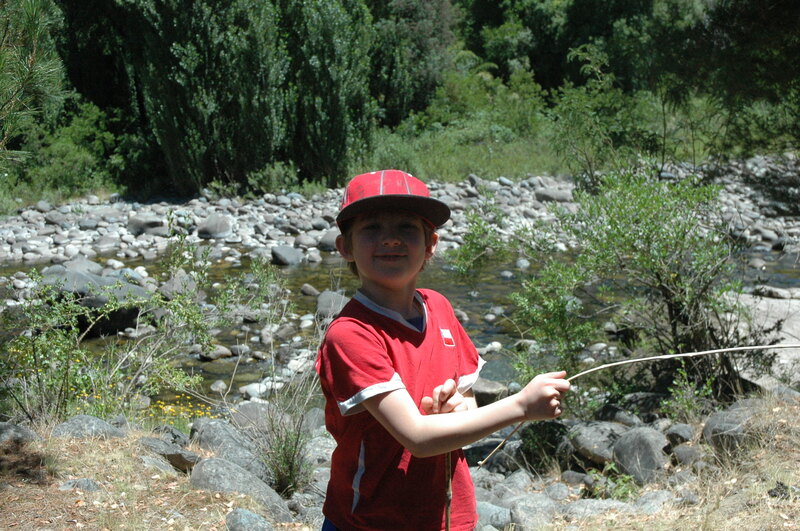 We were excited to have our first camping adventure with Donovan, and to show him parts of Chile that few foreign tourists ever have time to experience. Living in Chile is about living the extraordinary. I pondered this while enjoying the first morning’s cup of coffee, while perched upon a rock in the middle of the river that flowed past our campsite. The pine-covered sierra and babbling water were a good sounding board for my thoughts. After five years here, it seems incredible that I had previously devoted so much of my life to working endless hours, evenings, weekends and holidays to provide for a lifestyle that I barely had time to enjoy. It certainly didn’t take long for cookie-cutter subdivisions, perfectly manicured lawns, well-appointed furnishings, the latest and greatest electronics, cars and other accoutrements to lose their appeal. All I needed was a smooth granite rock, a hand-pressed cup of coffee, and the beauty of nature to find true happiness. One of the most interesting things about all of our stays at Camping Huequecura is that it is never the same experience twice. 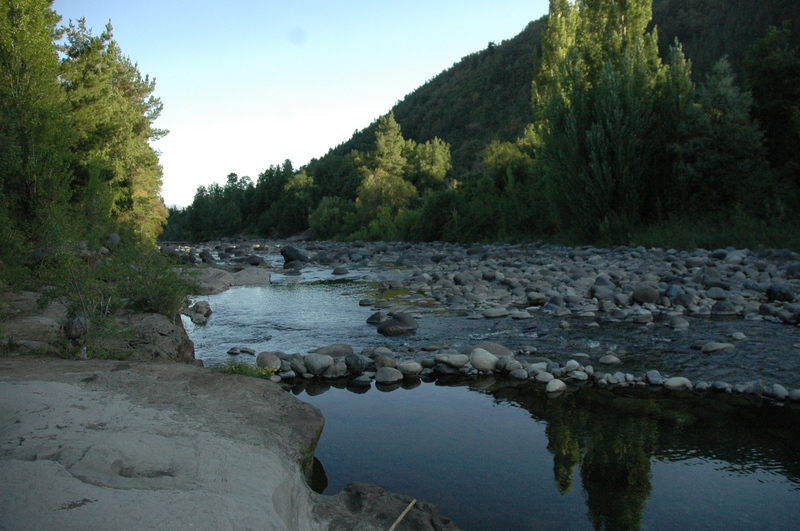 Even though we repeat activities, such as swimming in the pozos (swimming pools in the river), floating down the river while skimming over water-tumbled stones and boulders, and the nightly campfires, the land and river is ever in transition. Our interactions with nature adapt with the changes in seasons, weather conditions, the paths of the sheep that roam the grounds, and even the different campsites. Upon our arrival, we found that the sheep had taken a liking to crossing where our tents would be located, and were a little disconcerted by having their daily routine altered. Although they had greatly outnumbered our little group, the sheep were kind enough to also go with the ebb and flow of change. Nevertheless, images of wooly heads peering into the sanctity of our tent played in my thoughts for a while. 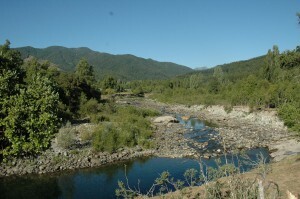 The river had changed as well. 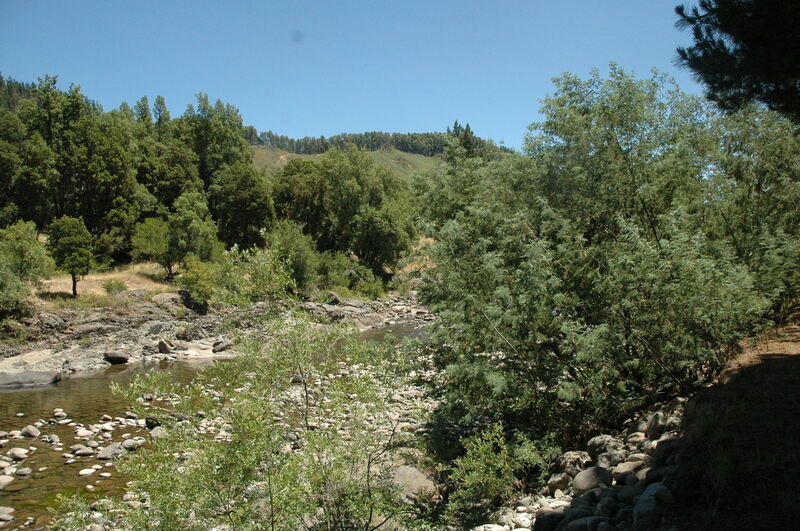 Whether it was the dry season, the lumbering of pines further up, or natural or manmade damming, the flow of water was greatly diminished compared to the previous summer. Last summer’s construction of a new power dam near Santa Barbara had increased my sensitivities to the precarious place nature has in modern life. The flow of financial currency is often given greater priority than preserving nature’s currency. Although new roads diverted tourists away from the dam site, my sense of loss and sorrow for the beauty lost still held ground. There is such an addictive pleasure to living out in the open, breathing fresh air, listening to nature’s music, and falling asleep under a starlit sky. The rhythms of daily life slow down to a gentle pace, with the only concerns being the preparation of daily meals and clean up. Gone are the burdens and stresses of work schedules, deadline demands and ridged routines. The days are wide open to hours of relaxation and play. For almost a year, we had lived with the anticipation of showing Donovan the delights that Camping Huequecura had to offer. Among them was the simple pleasure of swimming in crystal clear, mountain fed, river waters. Back home, rivers and creeks had become so polluted with sewage and run-offs that such delights no longer existed. Even the Great Lakes had become so contaminated from chemical plants and other sources that fishing and swimming were highly discouraged. While residents still enjoyed boating and other water sports, and summer life still revolved around lake living, such activities were embraced with a degree of restraint. So, after the tents were pitched, the table dressed for future meals, and the firewood gathered, we headed for a walk to the furthest point of the campgrounds, to begin the ritual float down. The walk to our starting point was a pleasure in itself, as it varied from climbing over rolled-rock strewn banks to strolls along a sun-dappled, tree-covered trail. It was just the right mix to hold the interest of an active 10-year old mind. We paused periodically to appreciate the pastoral settings, and to rest under shady trees. 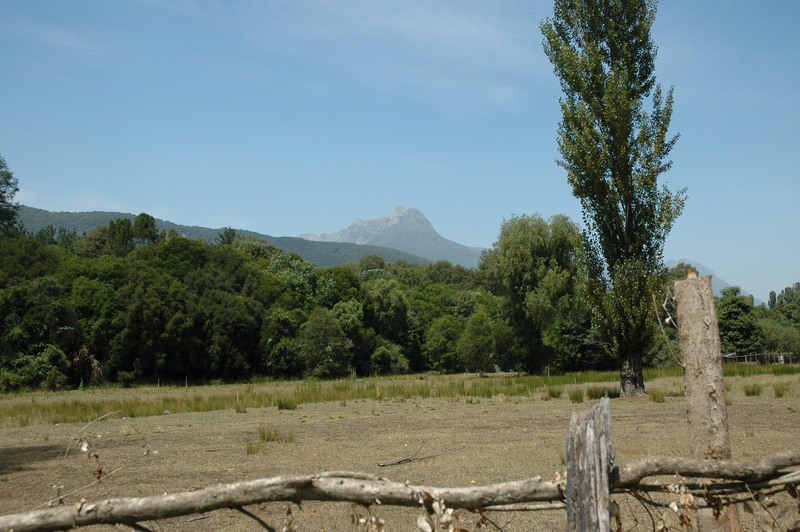 In the distance, we could see some of the craggy peaks of Siete Picos. Donovan took special delight in learning the alternative meaning to the range’s name, which also refers to a male body part in Chilean colloquialism. Double entendres are often a part of Chilean humor, and the naming of various sites is no exception. Just past the pastoral views that we stopped to enjoy, there is a suspended walkway bridge, which joins both banks together. Beneath the shadows of the bridge, there is a channel carved out of the sedimentary rock that lines the river. Rushing water and rock had had exacted its toll with the passage of time, leaving a deep hollow that was perfect respite from the summer sun. 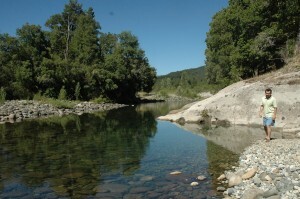 Although the water levels had dropped in the past year, it was still deep enough to enjoy the first leg of a swim back to camp. 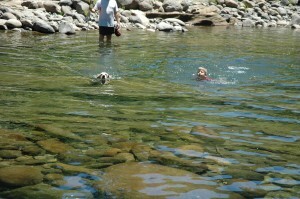 With the eagerness of an airborne fish, Donovan jumped into the water, with his aquatic sidekick Teddy not far behind. 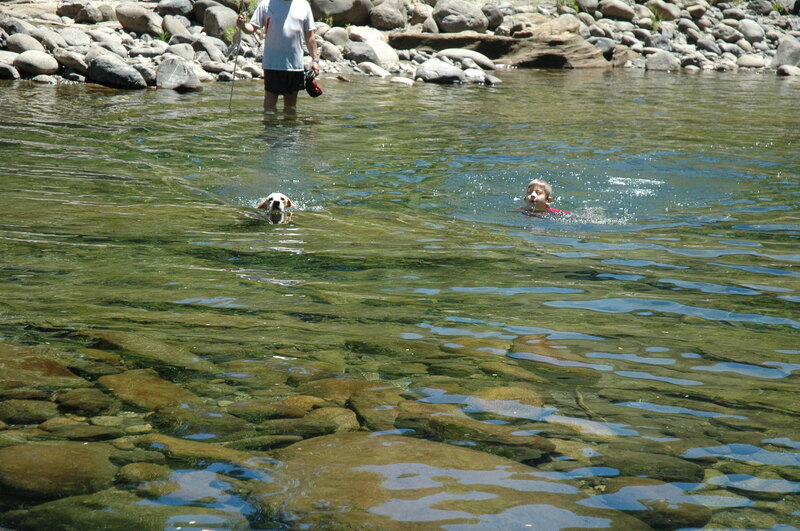 Side by side, they swam, just two heads skimming along the surface of the river. Teddy was so happy to finally have a boy of his own. So wherever Donovan went, Teddy was sure to follow. 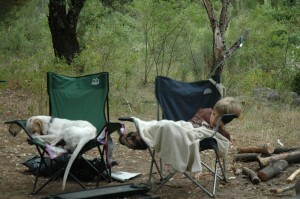 They ate, slept, walked, swam and collapsed into the camp chairs together. My mate and I just became backdrops to Teddy’s newfound world. 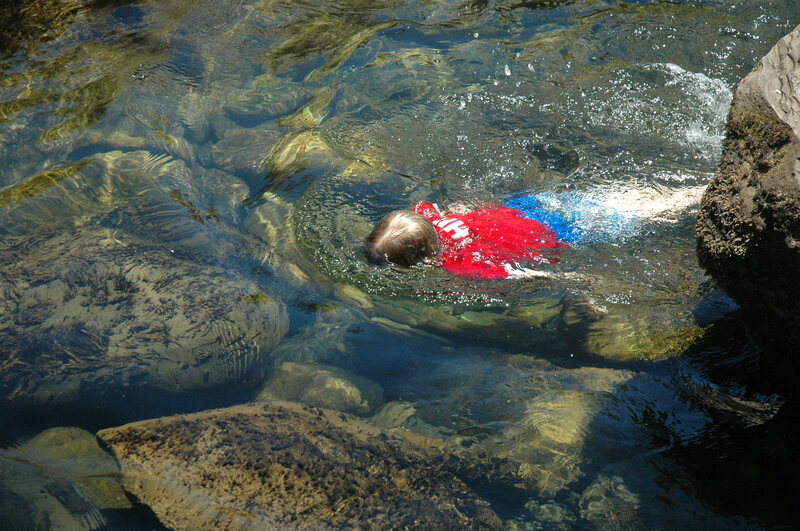 In Donovan’s newfound river world, the waters were so crystal clear that the rocks lining the bed seemed to graze the surface. He took delight in gliding over the surface while looking down to the intricate pattern of tumbled granite below. When not in the water, he could often be found perched on a rock in the river, shooting photos from a turtle’s eye view. Given his very first camera at Christmas, he explored the many different ways that the lens could capture his surroundings. Not limited by unspoken, ridged rules that most adults seem to fall into, Donovan positioned his camera in many various angles, and shot photos that gave new perspectives to his big adventures. Running through his files, it was interesting to see just exactly what he thought was interesting to see. It was unfortunate that the files exceeded the 2 MB limit for this site, for he saw things with an artistic eye. There were not only shots of the river, but also those of twigs and leaves co-mingling on the ground; wild dancing flames of the campfire; starry, starry night skies, and a tuckered out Ted. There is wonder in a young eye and heart, which sees life in an unencumbered, unlimited way. We found that nighttime in the campgrounds was also reigned by young hearts and ears. There was a younger crowd co-habitating among the many sites, and strains of youthful laughter, festivities and music carried through the pines. Although a little more boisterous that in previous stays, it was nothing so raucous as to ruin the enjoyment of the night. It does older hearts good to remember what it is like to be young, and it gave our little party a little license to be merry as well. Donovan and his new-found friend Adolay, who will always be a big kid at heart, kept us quite entertained with their impromptu raps. The next couple of days held some special and unexpected treats for Donovan. 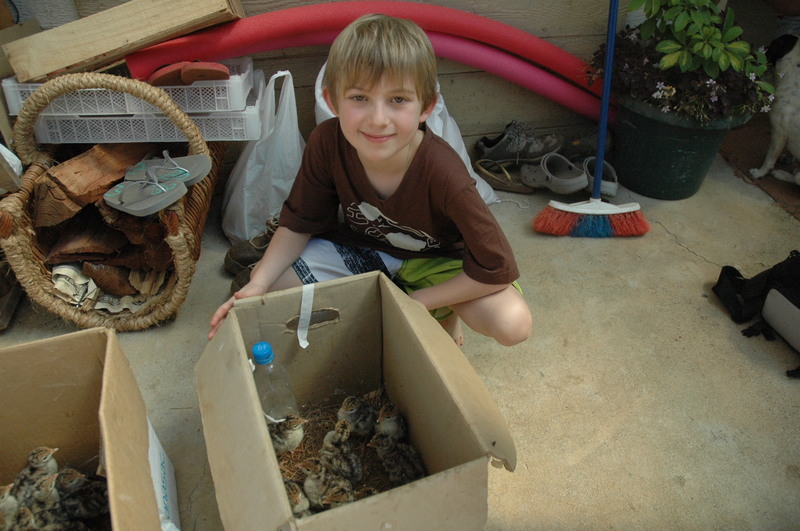 At the home of the ranch manager were two boxes of baby turkeys, Donovan had the rare pleasure (rare for suburban kids) to touch, hold and observe these young lives up close. Although he dreams of being an oceanographer one day, his interest and respect for all life was reflected in his gentle handling of these young creatures. Another treat was an afternoon spent swimming in a pozo away from the camp. The beauty of the landscape was astounding, and the waters were so crystal clear that it reflected the trees lining the banks, while displaying the rocks that covered the riverbed. Although looking shallow in the photo, the waters became quite deep in the middle and further on. Just beyond the bend was a cliff jutting out over the water, providing a natural board for diving. Although my fear of deep waters had returned, preventing my leaving the security of touching bottom, the others in our group reveled in displays of aquatic technique. It was unfortunate to not have a waterproof camera with to capture the afternoon’s frolic and brave dives into the river’s depths. On our walk back to the cars, I was struck by the incredible majesty of the region. Crystal blue rivers, lined with water-worn rocks, meander from hills in the distance to a rhythm all its own. There is nary an ounce of concrete, electrical line, satellite tower, or smog to mar or obliterate the view. 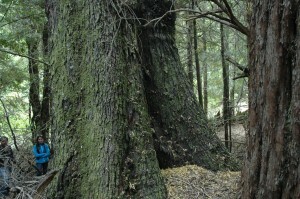 Equally as impressive were the massive and ancient trees that still abound in the forests. 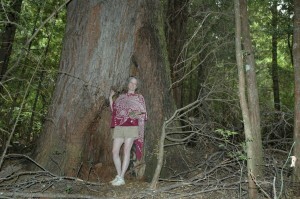 On our last day, we were shown a tree that would have taken dozens holding hands to encircle. 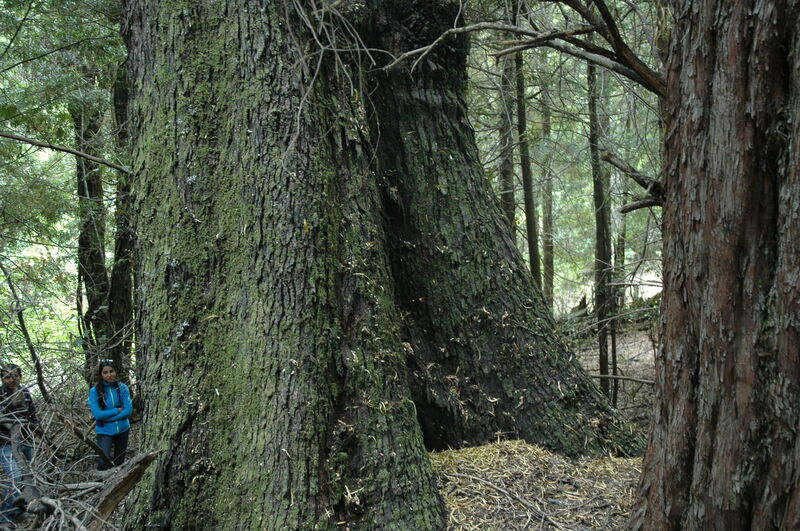 This was a tree that had seen millenniums, and not just centuries. It was impossible to see its top through the canopy of branches and leaves. On the narrow side was a hollow reminiscent of Merlin mythology. 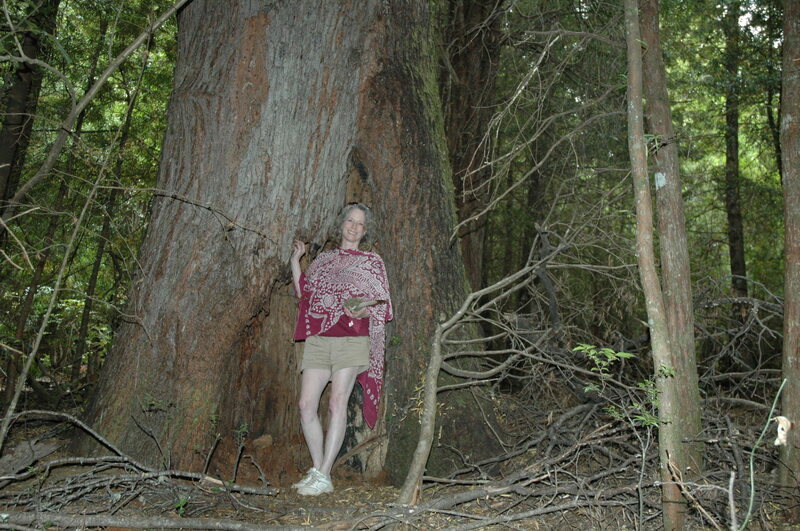 Celtic reverence for the sacredness of trees, and their connectedness with both Earth and Heaven reverberated in my thoughts. I stood for a time, with my hand placed upon this tree that had seen the passage of ages, to commune and appreciate the transformations of nature and humanity. Before leaving the tree behind, I stood for a time by the heart of the hollow, holding a bird’s nest and a feather that had crossed my path to the tree. Peace had descended upon my soul, standing in the presence of this tree. With the close of our Camping Huequecura adventures, both Donovan and Teddy were ready for a little rest and downtime. We would have a couple of days back in Concepcion to revel in our own memories of times shared, and recuperate before beginning the long drive to the sand-lined coast of Viña del Mar and Renaca. 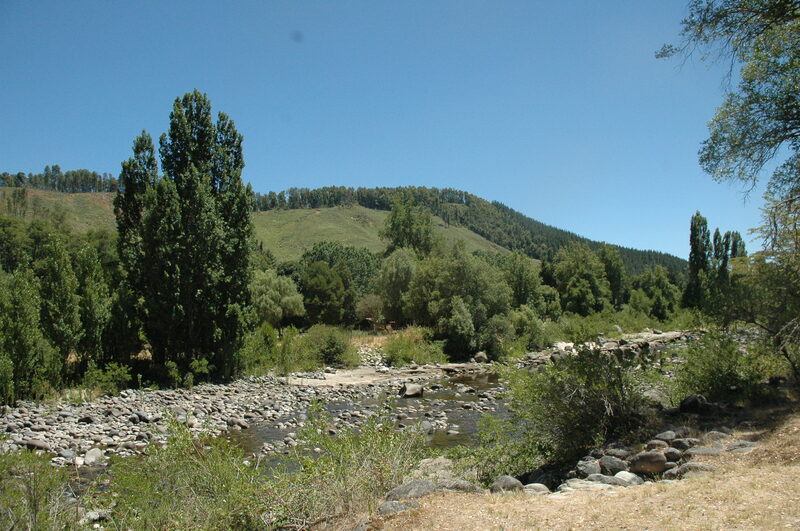 Camping Huequecura is by reservation only, and can be contacted at 98843914. They also have a page on Facebook. Camping, from Monday to Thursday is CLP$3.500 (about USD $7.00) per adult, and CLP $2.500 (USD $5.00) for children (5-15 yrs.) and seniors (age 65+). 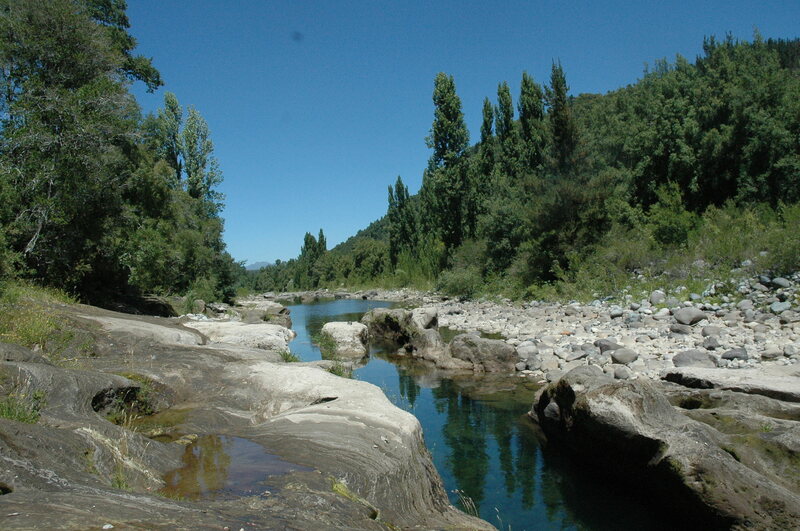 Friday to Sunday, as well as holidays, the price per day for camping is CLP $4.500 (~ USD $9.00) for adults and CLP $3.500 (~USD $7.00) for children and seniors. One-day picnics are: Monday-Friday, CLP $1.200 (~USD $2.40) for adults and children; Saturday, Sunday, holidays, CLP $2.500 (~USD $5) for adults and CLP $2.000 (~USD $4.00) for children and seniors. Camping Huequecura is closed for the season after March 31. During the month of March, they offer a 30% discount. Hi! Love your stories 🙂 I’m a 56 yr-old guy, looking at retirement in 5ish years. I have a touristy type trip planned to Chile for Dec/Jan this year (2014/15) with my girlfriend/partner. 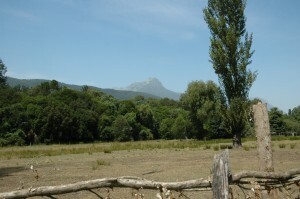 We’re planning to see the Volcano regions and the wine regions between Puerto Montt and Santiago for about 3 weeks. However, a secondary motivation will be looking into place to relocate for permanent residency for retirement. We’re not made of money, but will have a modest income, not suitable for expensive beach resort life. I’m more interested in a lifestyle change in the vein of modest country living somewhere in the region close to Los Angeles/Temuco or somewhere in between. Looks like fabulous country and great climate. Anything you can offer to help/advise/recommend would be most appreciated. Please feel free to contact me here or privately. I’m very serious about heading South, permanently! IIt was nice meeting you and your husband at the campground this recent summer. I misplaced your e-mail. I am back in the states doing my plumbing biz in So Cal. Just listed my house in Temecula Ca. and looking for property in the Sierra Nevada foothills. God willing I will be back in Chile for next summer season in october or ? We need to get the campground ready and update some facilities, so as you see I have work to do Lol. Will be going back and forth for now, since I have 3 of my 4 daughters and 2 of my 3 grandkids in the States.